In 2013, the social media world evolved, aided by our ever-present, always-on mobile devices and expanding content marketing. The ability to use mobile devices to capture photographs and videos of ourselves (as well as others) made selfie the word of the year. Yahoo purchased Tumblr for $1.1 billion promising not to screw it up. Twitter IPOed with a #Ring. Snapchat turned down $3 billion. 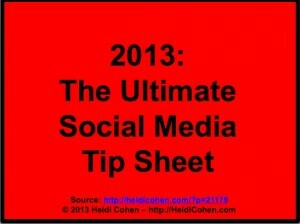 Here is the ultimate 2013 social media tip sheet containing 101 tactics based on our top 5 articles. They incorporate the unwritten social media rules. Know your target audience and their hot buttons. Write regular features responding to your audience’s needs and interests. Include a featured image as a reader magnet. Craft alluring headlines to attract an audience. Format blog posts to facilitate consumption. Ask visitors to follow you on Facebook and Twitter in your sidebar. Include social sharing icons at the top and bottom of every blog post. Incorporate your blog’s brand into your Facebook timeline photograph, Twitter image and background. Participate on Facebook and Twitter. Get your blog buddies to cross promote each other’s blog posts. Monitor what your competitors are doing on Facebook and Twitter. Like your post on your own Facebook profile. Share your post on your blog fan page. Create a graphic of your post information. Pay for views using Facebook’s promoted posts. Create a Facebook app to encourage blog email registrations. Tweet each blog post three to four times the day it’s published. Break blog posts into tweetable chunks. Pre-format tweets for reader use. Add optimal hashtags to extend reach. Use a scheduling tool to publish your tweets. Thank people for sharing your blog posts. Participate in relevant Twitter chats. Use images at the top of each post, preferably a photograph of people. Claim authorship of your content on Google. Link to other blogs and reference bloggers in your blog posts. Interview rock stars in your category via podcasts. Talk with experts in your field via video. Incorporate “ClickToTweet” into your posts to encourage tweeting. Share your blog content across social media platforms. Expand shareability on social media, especially Twitter with hashtags. Chop your column into a set of tweets and drip out over time. Create a pinboard specifically targeted at your posts. Leverage LinkedIn Groups to target content delivery. Create a public profile for your blog on various social media networks where appropriate. Leverage conversation on other social media platforms. Place images on Flickr that link back to your website. Understand where and how your target audience uses social media by creating a social media persona. Focus your social media efforts on those platforms where your target audience spends their time. Understand your target audience’s social media habits to ensure that you’re placing the appropriate content on these platforms at a comfortable rate of engagement. Post social media content that’s formatted for easy consumption. Leverage the power of your audience’s circle of friends. Write great Twitter-friendly headlines to attract attention. Create branded content that’s appropriate for Facebook consumption. Including one or more hashtags in a tweet increased the tweet’s likelihood of being retweeted by over 55%. Including quotation marks in a tweet made it 30% more likely to be retweeted than those that didn’t contain quotes. Tweets containing images uploaded to Twitter’s native image system (aka pic.Twitter.com) were almost twice as likely to be retweeted. Tweets containing Twitpic images increased retweets by over 60%. Tweets containing Facebook images (aka FB image links), suppressed retweets by almost 50%. The top of the CTA list were “please help” and “please retweet”. Manners matter more than character count. Including the words “retweet” and “spread” improves reach. “Visit” is at the bottom of the top phrases since it’s the closest to sounding like a promotion. The longer the tweet, the more likely it will be retweeted up to roughly 120 characters. Between 100 and 115 character tweets are one third more likely to get retweeted than tweets outside of that range. Share your content across social media platforms. Include social sharing on your website and blog. Respond to prospects and customers on social media venues. Link to information on your blog and website in your blog posts, SlideShare presentations and social media interactions. Pimp your products on Pinterest. Understand what your competitors are doing. Ask open-ended questions on social media. Nudge customers to rate and review your products. Encourage customers to share their photographs and stories. Explain how to use your product. Respond on forums and Q&A sites like Quora. Build your blog publishing empire. Claim your authorship and location on Google. Reconnect with colleagues and friends. Establish a robust content marketing editorial calendar. Incorporate a social media call-to-action. Create a Sale of the Day Tweet. Provide recipes and patterns that link to your product pages. Show customers how to style your products. While most of the tactics included in this 2013 social media tip sheet will continue to be effective, it’s important to continually test and measure your results. What else would you add to this list and why? Tags social media tip sheet, Social Media Tips. Bookmark the permalink. Agree that Quora is a great site. You can build authority there by answering questions, as well as learn heaps from knowledgeable people. Also, by seeing what questions people are asking, you can get some great ideas for blog posts. Interesting that hashtags increase the chance of your Tweet being retweeted. I didn’t know that. Thanks!